Did you notice the steel around that dropped bulkhead? 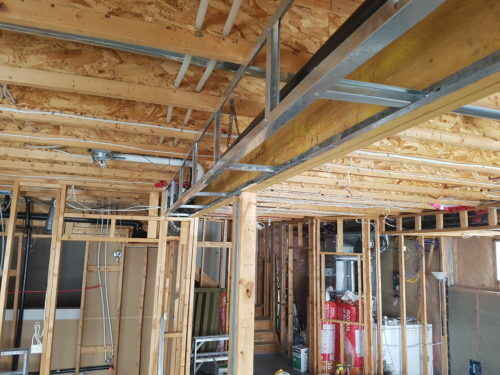 Not only are steel studs slightly smaller than wood 2″ x 4″ studs, they also will not warp, expand or contract, shrink, split, etc..
Now with that in mind, how do you feel now about your bulkheads and /or basement ceiling? Think about your smooth ceilings with recessed potlights in your basement rec room, your warped wood studs would be hard to hide across a smooth ceiling of drywall. Waves in your ceiling would be avoidable, if you used steel studs for framing. Using Steel Studs around your Hvac and awkward staircase ceilings also gives you more overall space. 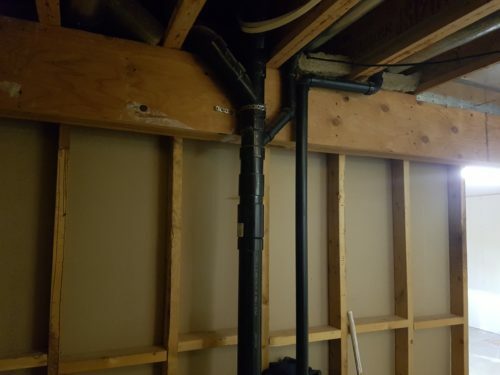 This is a really great example in a basement of where using steel studs to frame around these plumbing pipes would help condense the space used by traditional wood framing. You could probably cut down 6″ possibly as much as 1′ of space otherwise intruding into your bathroom or rec room. 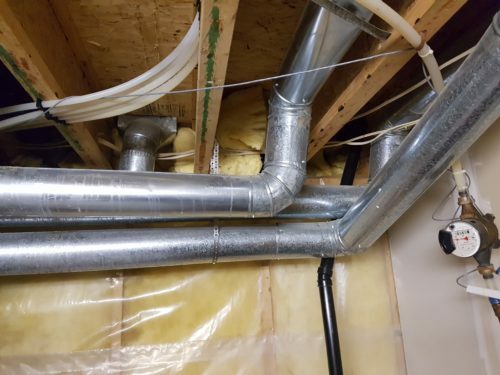 Check out those cumbersome Hvac pipes! Now who doesn’t have these in their basement. If not done correctly, a lot of homeowners will end up with HUGE bulkheads in their basements, sometimes too many! Steel studs tuck nicely underneath, again reducing the size of your bulkheads. Compact!